During the famed Peach Bowl year, Pirate fans were well aware of a linebacker from Blacksburg, Va., named Robert Jones. He was everybody’s All-American, and deservedly so. But there was another linebacker that year, a good one in his own right. That “other linebacker," as many around campus affectionately called him from 1987-91, was also a good one, albeit a bit more demure. Ken Burnette – a.k.a., No. 54 in your Peach Bowl program – quietly goes about his business these days as a sales executive for Sprint in Charlotte. Occasionally, he will bump into someone, get to talking about football, and eventually reveal his connection to ECU football history. But for the most part, his memories of the struggle he faced when he walked into the Pirate program as a 6-1, 187-pound safety in 1987, remain tucked away, serving as a quiet reminder that it’s not getting to the top as much as how you get there that matters. 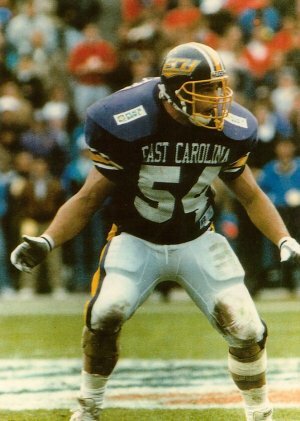 Ken Burnette in action during his days as an East Carolina LB. For Burnette, his years at ECU, above all, taught him a lesson in the value of perseverance and his years since, have taught him that balance and perspective lead to a much less disappointing life. That feeling for Burnette was like being on top of the world. As a high school player from Spruce Pine, NC, the hard-hitting defensive back expected that someday he would be on top of the football world. He dreamed it, ate it, slept it, thought about it all of the time. There was a fated plan for him. Offers would pour in his junior year. But that was not what happened. In fact, the only interest Burnette got was from smaller schools in lower divisions of college football. His high school coach Leland Riddle also believed in his player and used a connection within the Pirate coaching ranks, then-defensive backs coach Don Powers, to pitch a case for Burnette. Burnette was convincing and a plan was formed. He would come to ECU as a preferred walk-on, meaning that he – along with 11 others – were invited to attend camp at their own expense. That was it, and maybe Burnette could make it as a defensive back. Burnette’s trek from 187-pound safety to the Peach Bowl basher in the middle went something like this: First, he was red- shirted, where he took his turns on the scout team. Midway through the season, the coaches became concerned about a shortage of healthy players at the linebacker position and moved Burnette there for the remainder of the year. By that time, Burnette had beefed up to just over 200 pounds. “Prior to summer break, coach (Art) Baker met with me and asked me what my expectations were and I told him, ‘I expect to make the travel team,'" explained Burnette. "I asked him how I could get there. He told me that if I was on the traveling team for opening week, I would get a scholarship. “So, I came into camp determined to make that a reality. Coach Baker was true to his word, like he always was and in the fall of 1998, I was given a scholarship. From there, Burnette worked his way into a starting inside linebacker spot during his sophomore season, only to see his starting position vanish with one wrong twist of the knee. Heading into his junior season, ECU had switched Defensive Coordinators and Mike Cassidy brought into the program a new defensive scheme. The base was more of a 50 defense with the inside linebackers making the plays. Burnette was moved inside next to Jones where he would finish out his career. The tandem of Jones and Burnette were as effective a duo of linebackers as any in the country during the 1991 season. “Robert got a lot attention from the press which was fine to me,” Burnette said. “I was honored to be beside him. I complimented Robert. Robert deserved the attention. He was bigger, faster, and stronger. I don’t know if he hit harder…but I’ll give him the others. 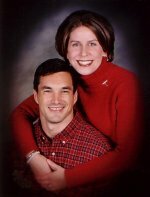 The tandem of Jones and Burnette, helped to write the fairy tale story that was the 1991 season for ECU fans. Above all of the excitement of that game in Georgia – where Burnette broke his arm – perhaps it was the lessons learned in the hotel after the game that have helped mold Ken Burnette into the man that he is today. “I went back to the hotel with my family and we kind of laid back for the rest of the night," he said. “I remember thinking about how I had played football every fall since sixth grade. Now it is over. There will be no more football. It was shocking thought to me. “Sometimes, wrongly, football was the biggest thing in my life. I had to realize that it is just a game. Once I got away from it, assessed my priorities, lined some things up and made the tough adjustment, I think that I finally figured out where (football) fits in life." Today, Burnette is a family man, well grounded in his faith and living with a clearer picture of what is most important. Still, Burnette will always cherish those things that ECU football afforded him. However, according to Burnette, the two things he misses the most are the friendships and the kinship developed through struggling together as a team. “I remember that I used to always say this thing in the huddle to the guys. I would say, ‘Nothing’s hurt now, let’s keep playing.’ I remember a couple years after I graduated, I was talking to Jerry Dillon (then a senior) and he told me that he borrowed that phrase. It made me feel good…connected. Burnette gets a little of that back, coaching outside linebackers at Hopewell High School. And, every once in a while, he gets a thrill out of being remembered.